Bookstores are dangerous places for me. I invariably leave with less money—and more books than I’ll ever have time to read. But I have to support my habit: I’m basically an idea junkie. I like to learn things, absorb new ideas, and challenge my mind to form connections between concepts that don’t seem to go together. So I choose books not because I assume they’re true, but because I expect them to be interesting or thought-provoking. When I’ve finished reading a book, though, I usually have a pretty strong sense of whether or not I believe it. After reading a dozen books by Carlos Castaneda—along with quite a few criticisms of his work—I could only come to the conclusion that some or all the stories he told may or may not be somewhat or completely true. This very uncertainty is one of the things that makes his books so interesting. I have since revised my conclusion—about which more later. But first, some background. For years, as I browsed through second-hand books, I frequently came across Castaneda’s The Teachings of Don Juan: A Yaqui Way of Knowledge. I’d invariably pick it up, glance at it, and put it back on the shelf. Then I read Fritjof Capra’s The Tao of Physics, which had a brief quote from don Juan at the beginning, and that piqued my curiosity. Shortly thereafter, I ran across the book at a thrift shop and decided I could give it a whirl for 50 cents. Within a few pages I was hooked, and after finishing it I read all 11 of its successors. For better or worse, I was too late to be a groupie—in April, 1998, before I had finished reading all of the books, Castaneda died. Only then did I begin to realize the extent of the controversy surrounding his life and work, and the state of confusion he left behind among both fans and critics. For those unfamiliar with Castaneda and his books, here’s the short version of the story. Castaneda was studying anthropology at UCLA in the early 1960s, and during the course of his field research in Mexico, he claims to have met a Yaqui Indian named Juan Matus. Don Juan was reputed to be an expert on medicinal plants, and Castaneda hoped to use him as an informant to learn more about the use of peyote among certain groups of native Mexicans. The Teachings of Don Juan purports to be an anthropological study of the way don Juan used a variety of hallucinogenic plants as part of a system of sorcery. The research, however, was participatory rather than objective, and don Juan’s intent was apparently to treat Castaneda as an apprentice, indoctrinating him into the ways of the particular brand of sorcery he practiced. The hallucinogenic plants turn out to be a red herring. In Castaneda’s next book, A Separate Reality, they have a more limited role, and from there on, they’re barely mentioned. The books focus on other aspects of Castaneda’s training as a sorcerer, along with several other apprentices of don Juan and his fellow sorcerer Genaro Flores. Eventually don Juan reveals that he only taught Castaneda about the plants to get his attention; most of the teachings are internal, psychological. Castaneda learns how to turn off his inner dialogue, control his dreams, perceive other people as luminous energy, and behave in a manner don Juan calls “impeccability.” A lot of time is devoted to an exercise called recapitulation, in which Castaneda recalls and relives all the events of his life. At the end of Castaneda’s fourth book, by which time he had been working with don Juan for over a decade, don Juan and don Genaro “leave the world,” which readers are supposed to understand not as death but as a deliberate crossing into another plane of existence. Surprisingly, the story does not end there. Castaneda returns to Mexico two years later and meets up with the other apprentices of don Juan and don Genaro, some of whom we haven’t heard of yet. By the sixth book, The Eagle’s Gift, Castaneda and another apprentice, a woman nicknamed “La Gorda,” discover something shocking: during the years of their apprenticeship, don Juan had frequently made them shift into a heightened state of awareness, wherein he had taught them a variety of things that they could not remember in their normal state of awareness. There follows a long reexamination of their entire relationship with don Juan. They find that most of what they thought they knew was wrong or at least irrelevant; all the most crucial teachings had been hidden, delivered as they were in this altered state. Castaneda’s penultimate book, Magical Passes, covers a series of movement exercises vaguely like ch’i kung, which are supposedly a key component of the knowledge don Juan revealed—even though they’re barely hinted at in any of the other books. Where Castaneda’s other books were simply reporting his own experiences, this one alone is actually written as an instruction manual. From the publication of Castaneda’s first book in 1968 until today, he has been subject to harsh and relentless criticism. Entire books have been written on this subject, but I’ll give you just a sampling. First, many critics question whether such a person as don Juan ever existed. Only Castaneda and his close associates seem to have met him; there is no photograph or documentary evidence to prove he existed, or even a corpse—he conveniently “vanished.” Anthropologists point out that a number of the details Castaneda gave are inconsistent with what is known about the Yaqui Indians, native Mexican sorcery, and even the geography, flora, and fauna of the places Castaneda claims to have visited. Likewise, critics have cited other sources of suspiciously similar stories, suggesting that Castaneda “borrowed” some of his material. In addition, critics say, his stories read a bit too much like novels—real life doesn’t arrange itself that neatly for literary convenience, so at minimum he must have employed some artistic license in his descriptions. Then, of course, some worry that his discussions of hallucinogenic plants encourage the use of drugs. Castaneda himself refused to respond to any of his critics. He was for the most part a recluse, declining to be interviewed or even photographed. His unwillingness to defend himself or offer proof of his claims was seen as an implicit admission of guilt; on the other hand, Castaneda’s own books repeatedly say that according to don Juan, a life of obscurity is absolutely essential to a sorcerer. Apologists thus counter that Castaneda was simply practicing what he preached. He did, however, conduct seminars and workshops for a select few students. One of these students, Amy Wallace, was Castaneda’s lover (or one of them) for a number of years. Her 2003 memoir Sorcerer’s Apprentice gives an unprecedented (though clearly biased) inside look at the real Castaneda. A fascinating read, it details the life of a man who appears by turns to be a highly evolved guru and a megalomaniacal cult leader. Wallace’s bottom-line opinion: don Juan almost certainly did not exist, but Castaneda, though deeply disturbed, was a genius who believed deeply in the path he followed. This seemed to be the general consensus of those interviewed for the 2004 documentary film Carlos Castaneda—Enigma of a Sorcerer, made by another former Castaneda student, Ralph Torjan. Another book with a different (and also rather uncomplimentary) view of Castaneda was A Magical Journey With Carlos Castaneda, written by Margaret Runyan Castaneda, who claimed to have been married to Carlos for 13 years (though there is some uncertainty as to whether she really was). In any case, these books and the film together erased any lingering faith I may have had in the veracity of Castaneda’s writings. Unlike his students, I can’t take his ideas seriously knowing what I do about him. 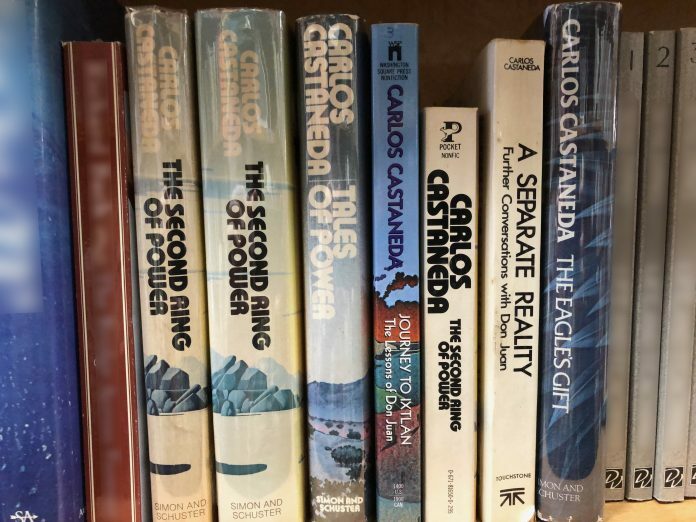 What makes Castaneda’s books so compelling to many is their vivid descriptions of the world as perceived through the eyes of a sorcerer (or “man of knowledge”—in Castaneda’s usage, the term “sorcerer” does not carry any undertones of evil practices). Some of the experiences he reports are frightening, shocking, or simply off-putting, and they wouldn’t make the average person say, “Hey, this sounds like fun, I think I’ll become a sorcerer.” What they suggest, though, is that the underlying reality of the world is not at all as most people perceive it, that ordinary human awareness is, as it were, a bad habit. Castaneda’s writings have attracted such a following for much the same reason as The Matrix or The X-Files: people want to believe that there’s more to the universe than meets the eye, that a more fantastic world lies beyond our perception. Whether Castaneda’s version of alternative reality is the right one, or even approximately correct, is the question. But whatever your opinion of Castaneda—a prophet, a fraud, or a misguided fool—his books are fascinating and thought-provoking. Even in fiction, there are kernels of truth. Note: This is an updated version of an article that originally appeared on Interesting Thing of the Day on June 19, 2003, and again in a slightly revised form on October 21, 2004.